Brief Synopsis: Eight single men, full of hope, departed on a long journey to Moscow to pursue the luck. How strong is their faith that the salvation could be in a woman? And what could a woman do for love? 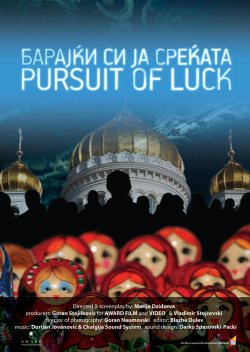 The Pursuit of Luck is a documentary film consisting of 3 stories (Hope, Faith and Love) in which the destinies of the main protagonists intertwine in their efforts to find happiness. Photo gallery - Premiere of the movie in Skopje, 22.11.2013 "Cinedays"